Below Are Photos & Tales From Our Users Of SALT-X. Use SALT-X Regularly To Maintain Your Equipment In Top Condition! If You Would Like To Share A Photo Or Fish Tale, E-mail Or Mail It In To Us (Address On Our Home Page) With Your Permission To Place It On This Site. "I use SALT-X after every fishing trip to make sure my equipment won't fail me when the Big One wants to fight." 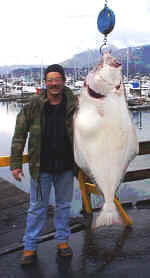 I caught this Halibut on T.U.F.-LINE Plus which is the Ultimate Big Game Braided Line! 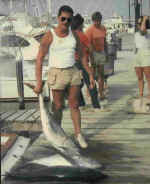 "Yellow Fin Tuna Fishing, 110 Pounds, 16 July 1986"